We forged ahead with the laptop repair, and luckily, Best Buy ended up solving the initial dilemmas for us. When the laptop came back for the 4th time still broken, they agreed to honor the terms of the Black Tie Warranty and replace the computer. I opted to take the value in a Best Buy gift card, and this was enough to purchase a Mac Mini (we decided on the lower-end $599 version), plus about half the cost of a new TV. we were told that a plasma TV presents a far superior picture, however plasmas start at 42” and we were confined to a 40” or smaller due to the spot we were planning on putting it. we were told that you most notice the benefits of of 120hz if you are planning to use the TV primarily to watch sports and play video games. We weren’t doing much of either of these, and looking at the 60hz side-by-side with the 120hz in the store, we saw no difference, even when sports was on. So, the computer and home theater staff at Best Buy were very helpful and we were told that we would need an audio cable to run from the Mac Mini’s headset jack into the television, plus an HDMI cable to connect the TV to the computer. Also, the Mac Mini has a Mini-DVI port so we needed an HDMI to Mini-DVI converter. (We learned later that this was the WRONG audio cable – see Conclusion). So, we were taking the computer and the new TV home but would have to wait to hook it up until we received the cable and the converter. At this point I also did some research on USB tuners for Mac and most sites pointed me to the Elgato Eye TV Hybrid, and in reading about this I became convinced that since digital channels are free over the air, our tuner would better pick up what was available if we got an antenna to amplify the signal. 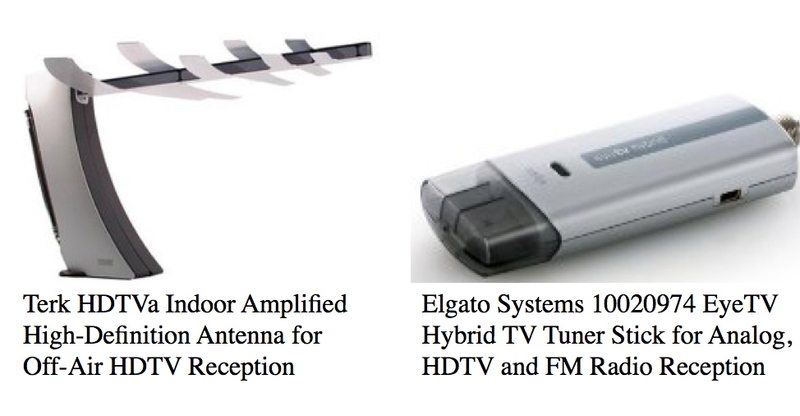 So included in my Amazon order was also a digital antenna and the Elgato tuner. This was not an insignificant investment as the total cost of my Amazon order was almost $200. And I learned that shopping around for antennas pays off too because I almost ordered it from another site for more than $75, and found that Amazon was offering the same one for $36. I’m not actually sure if I really needed the antenna, and I’m also not sure if the audio cable I got is the best way to get sound from the computer to the television. But I will find out, because finally all the orders came in (it only took a week with standard shipping) and I’m now ready to move on to the next phase of my Adventure in Dumping Cable…trying to get it all hooked up and working. Stay tuned for Part 3!